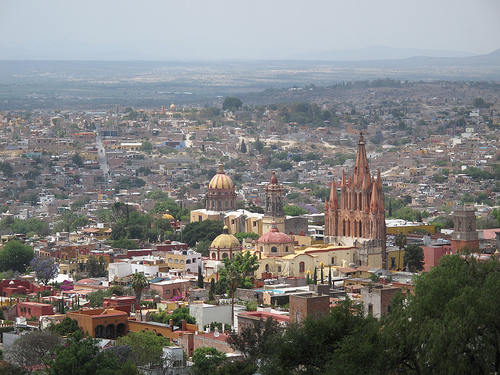 Home to one of Mexico’s largest American ex-pat communities, San Miguel de Allende, at the beginning of the 20th century was in danger of becoming a ghost town. It was snatched from the jaws of obscurity in the 1930s and 40s when its colonial structures were “discovered” by foreign artists who promptly moved in. This gave the town a reputation as an art community which attracted more artists. This, in turn, attracted foreign art students (many of whom were GIs going to school after WWII on the newly minted GI Bill). Since the mid-twentieth century, the town has amassed a large number of foreign retirees, artists, writers and tourists, which is causing an economic shift from agriculture and industry to a foreigner/tourist-based economy. The main attraction of the town is its well-preserved historic center, filled with buildings from the 17th and 18th centuries. This, and the nearby Sanctuary of Atotonilco, have been declared World Heritage Sites. Founded by Fray Juan de San Miguel over 450 years ago, San Miguel de Allende besides enjoying one of the best climates in the world, is a bright fascinating city, full of artistic and cultural riches. In the center of the city is the Parroquia of San Miguel Arcángel, that has become a very important landmark in this beautiful place. San Miguel de Allend e is considered by many to be, not only one of the most beautiful cities in the whole country of Mexico, but in the whole world. Estimates of city’s foreign census range from 8,000 to 12,000 with about 7,000 of these from the United States. 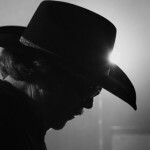 The American ex-pat community is large enough to warrant its own U.S. consulate. The city acts as a community center for foreigners, and has a chapter of the Lion’s Club, a post of The American Legion and VFW, and Mexico’s only Audubon Society chapter. And, “Despite being home to one of the heaviest concentrations of North Americans in Mexico, Lake Chapala doesn’t feel quite as Americanized as San Miguel de Allende . . .,” according to website, Latin World. And, although it is located in the center of Mexico and is crossed by a number of highways, the state of Guanajuato (with almost 5 million people) is rated medium on the MoMM safety scale. But, that record is improving!!! And, the very large, very active community of gringos wouldn’t be there, if it were dangerous. Always remember when thinking about safety in Mexico, to keep it in perspective by comparing it to U.S. murder numbers. See our comparison charts at Murder in Mexico. What a Joke! However, there is a downside to all the refurbishing that American ex-pats have been doing to the original colonial homes and buildings – the cost of real estate is up! The upside to foreign interest in colonial Mexico is that several banks have moved in to fill a need for mortgage lending. Something that can be difficult to find in Mexico. The are two international airports near San Miguel de Allende: the Aeropuerto del Bajio, located 110 kilometers (about 70 miles) from San Miguel, and the recently opened Aeropuerto Internacional de Queretaro, about 75 km (45 miles) from San Miguel de Allende. A third option is the Benito Juarez Airport in Mexico City, which is about 4 hours from San Miguel de Allende. The Mexico City airport has a larger choice of flights and is served by a broad range international airlines from across the world. And, in general, flights to Mexico City are cheaper than flights to Bajio or Queretaro, however flying into Leon or Queretaro is considered more convenient. Although the airport in Queretaro is closer, flights are usually more expensive than at Bajio. The new Queretaro airport has fewer flights, currently receiving only one daily flights from Aeromexico and Continental. Most travelers prefer flying in to the Aeropuerto del Bajio. At any of the airports, you can arrange for a transportation service to San Miguel. Most of the drivers for these services speak English and know San Miguel well. Driving to San Miguel de Allende can be a challenge. Even the best roads weave through the mountains of Northern and Central Mexico. As one Texan put it, “the only roads in Mexico not going up, are the ones going down . . .” There are very modern toll ways running throughout Mexico, however the tolls can add up quickly. It costs about US $65 in toll fees to drive from Nuevo Laredo to San Miguel de Allende. And, gasoline is as expensive in Mexico as it is in the United States. For medical concerns, San Miguel de Allende has several 24-hour pharmacies and two general hospitals serving the community: a public hospital managed by the state of Guanajuato, and a privately-managed hospital which boasts a large variety of specialists, including pediatricians, cardiologists, and specialized services such as plastic surgery, ophthalmology, and orthopedics, among others. Shopping in SMA (as it’s known by the natives), if you’re in the market for artisan and craft products, is a smorgasbord. The local artist community presents an array of art, jewelry, handcrafts, food and decor that should satisfy even the most hardened shopper for years to come. For the more mundane living supplies, local stores supplemented with a semi-monthly trip to Querétaro to shop the big box stores (Costco, Sam’s Club) will more than adequately cover it. 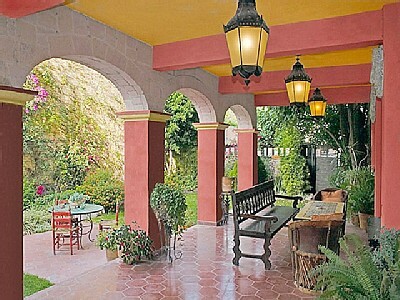 If architecture or remodeling is your thing, and you have, at least, a “B+” income, try San Miguel de Allende. You’ll love it! !